It's another festive 12 Days of Holiday! 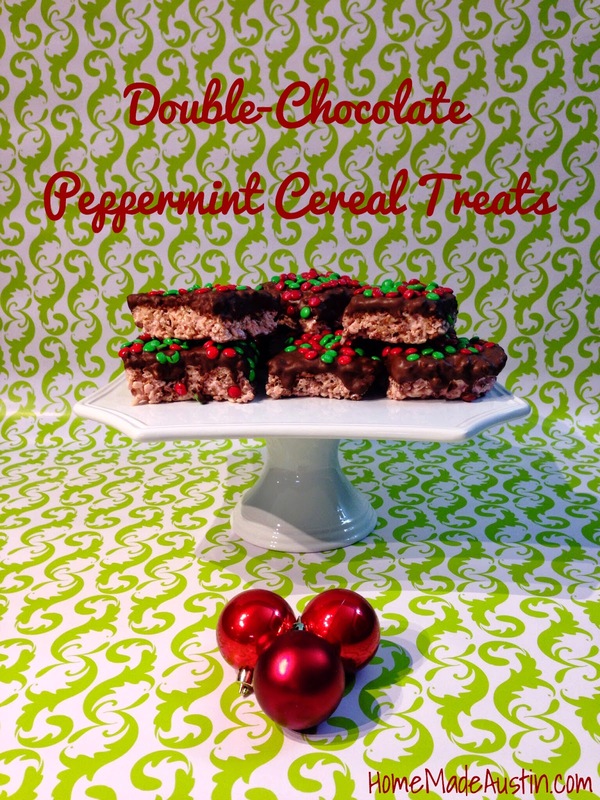 I offer you a fun new take on everyone's favorite today, cereal treats! 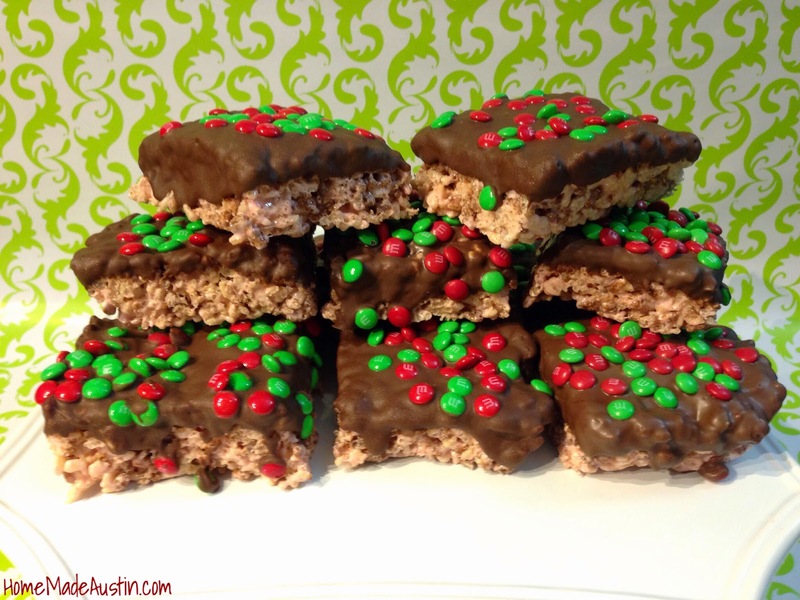 All the stops were pulled out for this tasty snack that's made with both regular AND chocolate crispy cereal, & have a touch of peppermint thanks to a few minty marshmallows. But, it doesn't stop there. These bad boys are dipped in chocolate & topped off with m&m candy bits. Mmm, peppermint, mashmallows & chocolate. With a little more chocolate. Nothing better, right? It's alotta of goodness in one bite. 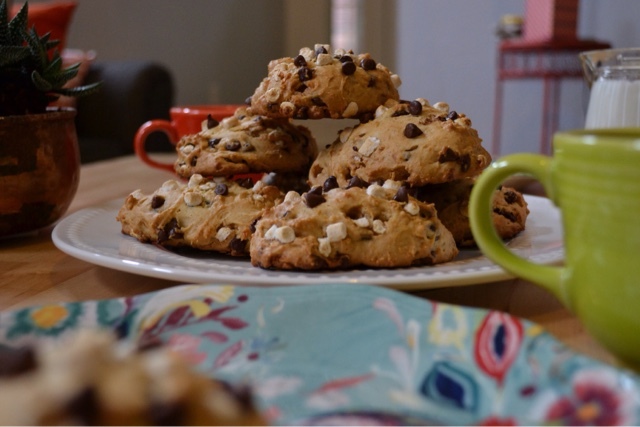 This is a wonderful, quick goodie to bring a little extra cheer to work, or a fun winter dessert the kiddos can help make. It's a win, win for lots of occasions. In a large microwave-safe bowl, melt both kinds of marshmallows & the butter, in 30 second intervals, stirring in between to combine. Repeat until marshmallows are completely melted. Add in all cereal & pour out into a greased 9x13 pan. Allow treats to set up. I put the 9x13 in the freezer for a few minutes to allow them to become 'harder' and therefore easier to cut & dip, but it's not necessary. Cut cereal treats into equal pieces. I was able to get 12 extra large or 24 regular sized treats. Following instructions on your chocolate melting discs, melt chocolate. 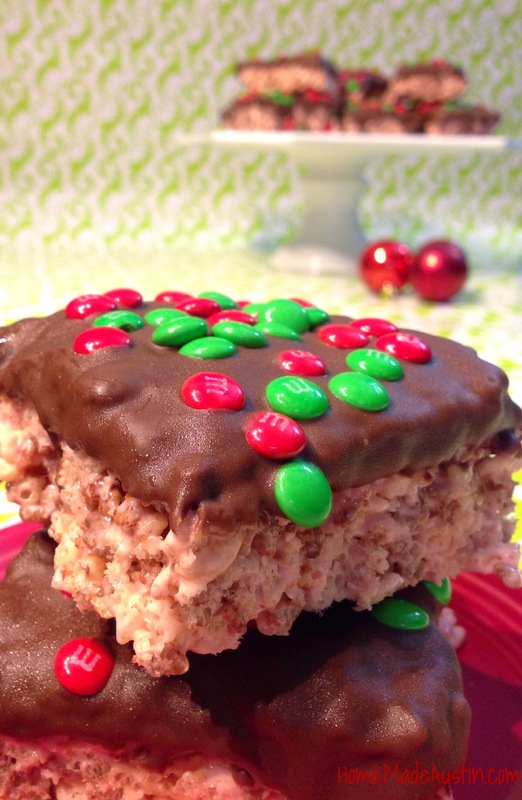 Dip the top half of each piece, turn chocolate side up on parchment or wax paper & immediately top with m&ms. After dipping all treats, allow the chocolate to set up & harden. Store in a cool dry place.